After posting about my Stress-free Halloween Fun Stations, I had a bunch of requests for similar posts for other holidays . . . including Valentine’s Day. 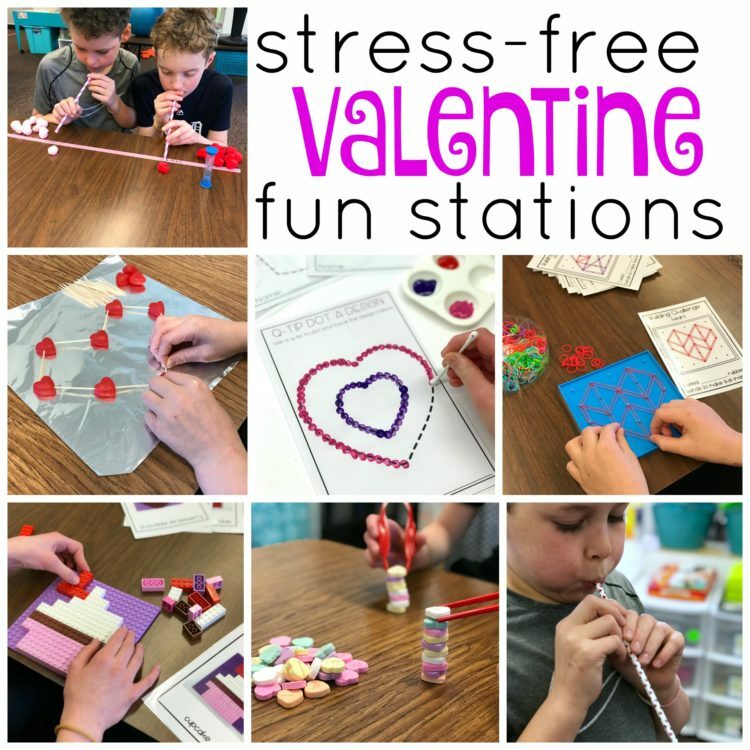 I know a bunch of teacher friends dislike these days and planning a ‘party’ is beyond stressful with everything else we do, so I make my parties as simple as possible by filling time with simple, stress-free fun stations. 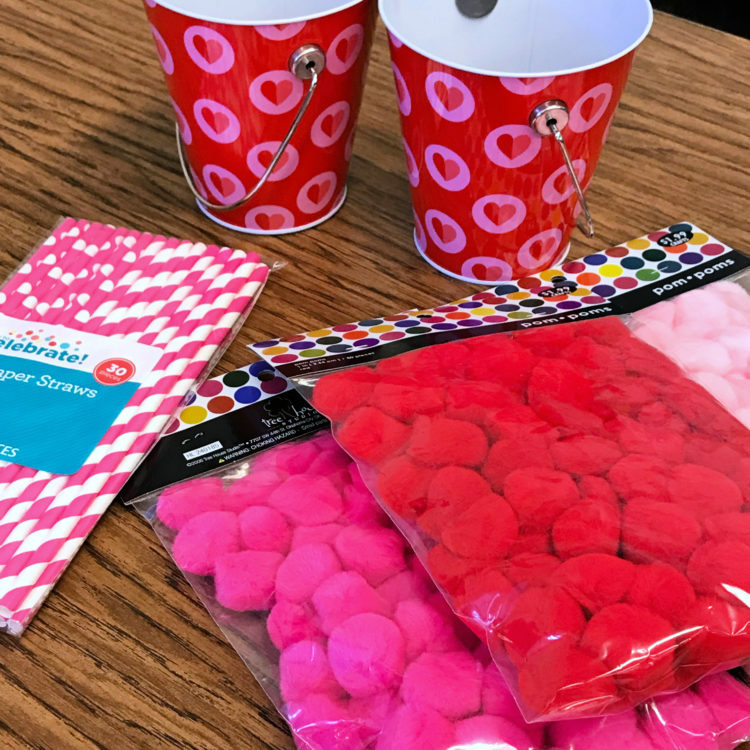 I know that there are many teachers that have the benefit of a ‘class parent’ to plan these things, but I don’t so this works out best for my busy classroom. They are engaging, easy and most importantly . . . very independent. One of the most difficult hurdles in putting together a holiday-themed activity day is that you have to fit it into an already busy schedule. I put together my typical schedule to show you how I fit it all in. If at all possible, I like to keep my routine as close to normal as possible. I think my kinders do better when they know what to expect and the day runs much more smoothly. 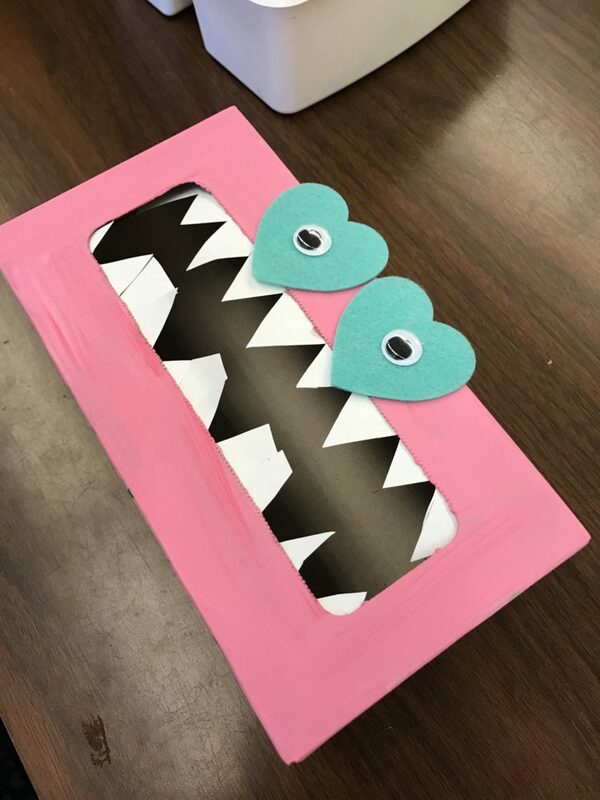 12:10-12:30 Rest/Valentine’s Day Video (It’s during this time that I have students put out their cardholders and students take turns passing out their cards. 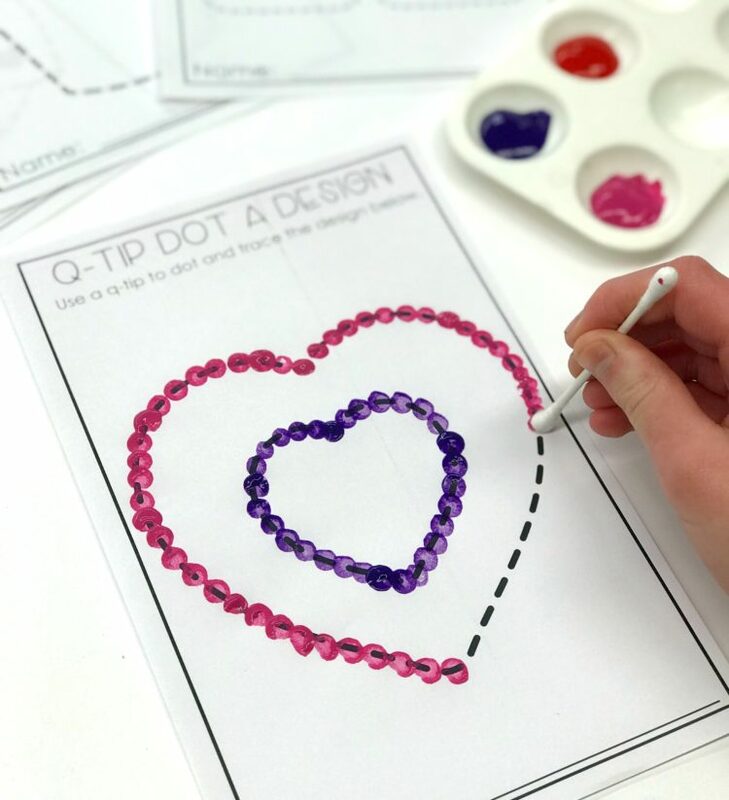 1:15pm – 2:15pm Valentine’s Themed Fun Stations Each station lasts for about 10-15 minutes depending on how many stations you use. It can go longer than this time or shorter as needed. 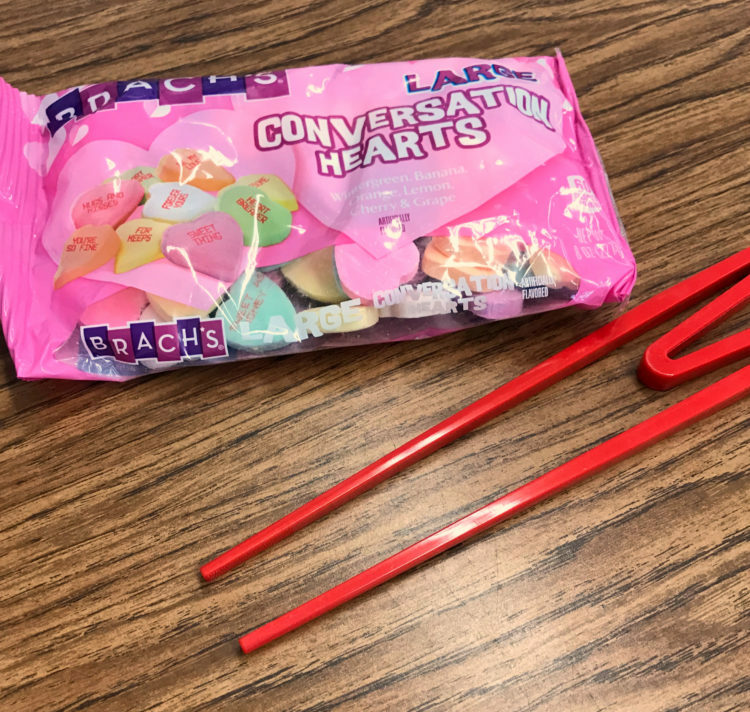 2:15-3:00 – Valentine’s Snack and open up notes. 3:00-3:35 Pack, Recess and Depart for the day. The big elephant in the room when it comes to Valentine’s Day is . . . what do you do about the cards? When do they get handed out, how do you hand them out . . . it can be SO chaotic and time-consuming if you’re not careful. Because I don’t have an enormous amount of time for passing out Valentines in my class, I always request that parents send in the necessary number of Valentines signed by their child and simply addressed to ‘a friend.’ I think this simplifies the ‘passing out’ process immensely so that I can have it completed for a class of 22-25 students in about 20 minutes. I’m listing a few of the stations I’ve used here in the past. You should feel free to use the ones that work for you. Pick and choose as you please. I usually have no more than 5 or 6 stations going and they last maybe 10-12 minutes each. 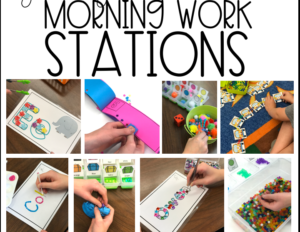 I love the familiarity of these stations for my students which makes them independent. 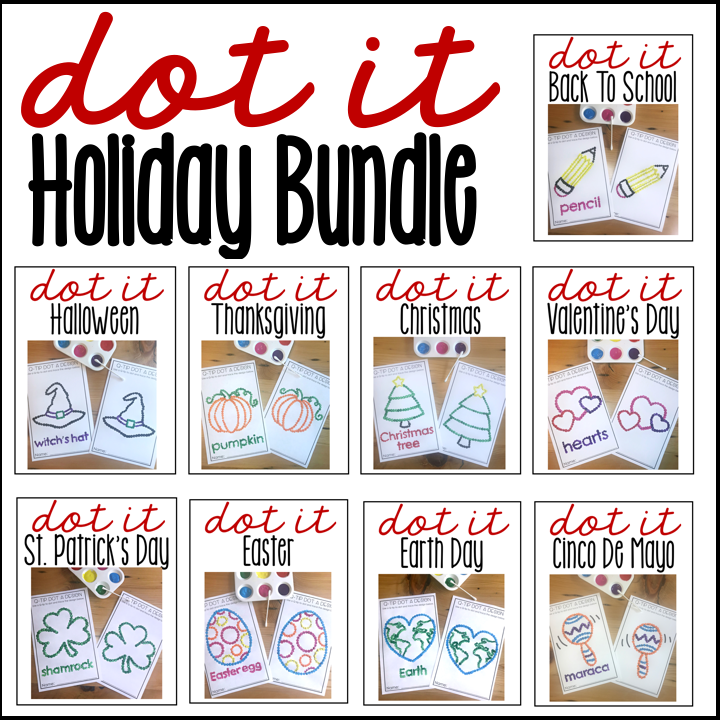 Some of these stations are available in my store and others are ones you will just need to grab some supplies to create. I hope you find something that work for you. 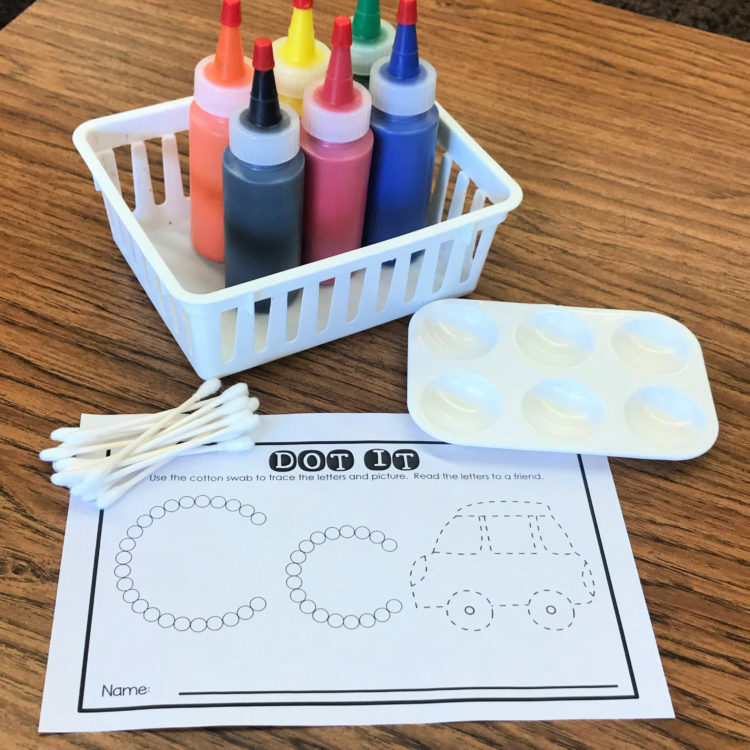 Dot-it pictures allow students to get a bit creative while also practicing those fine motor skills they so desperately need. 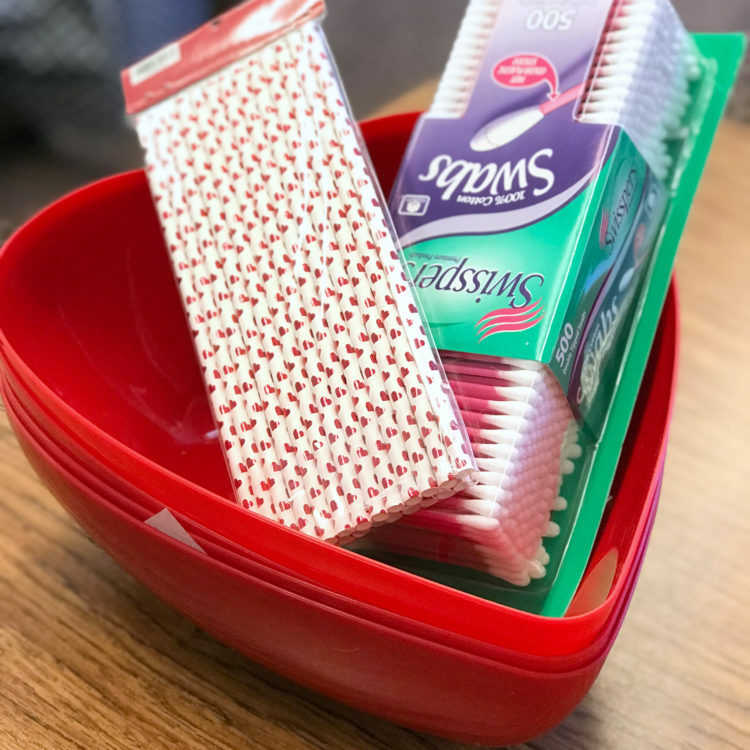 I place out a bit of paint in a tray and students use Q-tips to dot and trace the outline of the picture and Valentine word that goes with it. I have many pictures which they can choose, so even if they finish, they can grab another to do. 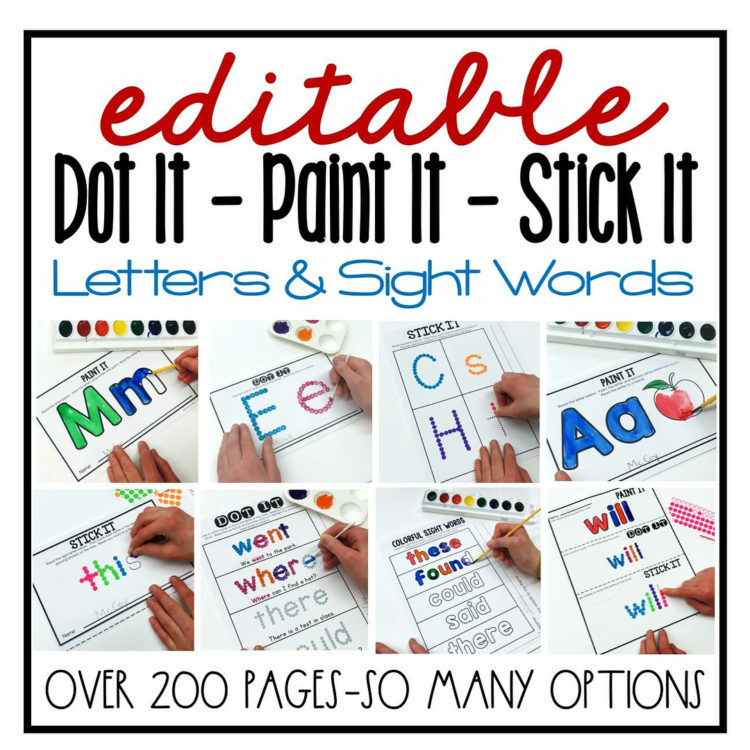 If you like Dot-It, be sure to check out my other Dot-It products including Dot It, Stick It, Paint It Editable Letters and Words. 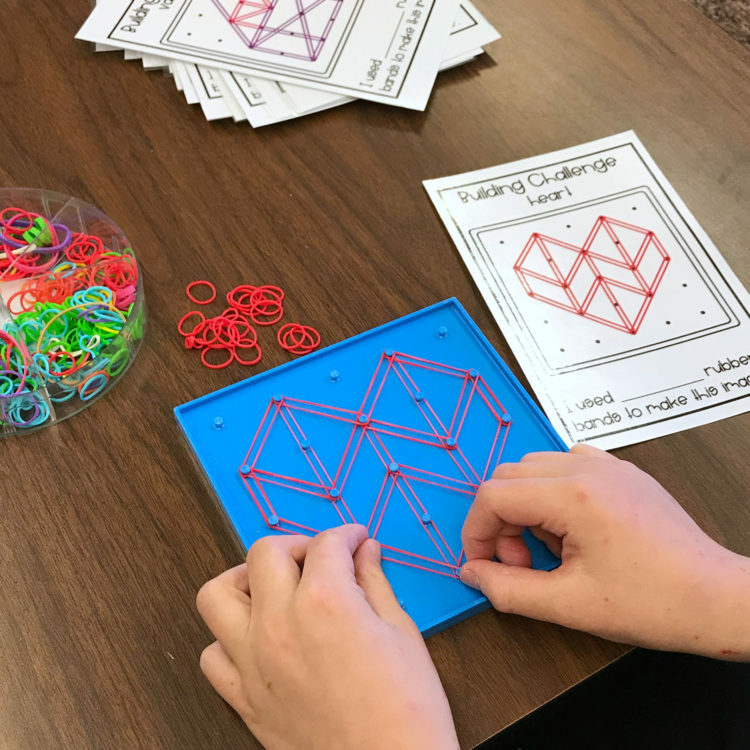 This station game is a take-off on a Halloween game that my students LOVE —Spider Races. (You can check it out here!) You’re going to need two different colored pompoms for this activity. You can select pink and red or pink and white . . . use what you have available but make sure you have about 10 of each color. Students will be given a time of one minute to race. They start at one end of the table and using a straw (they each get their own) they blow their colored pompoms to the end of the table and into their bucket. If their pompom goes off the table, it’s back to the starting line. Once they get one in, they come back and grab another to race down the table. When the timer goes off, they count to see how many pompoms they were able to get in their bucket. You can make this more or less difficult by adding different kinds of tongs for students to utilize. Chopsticks are even a great challenge. 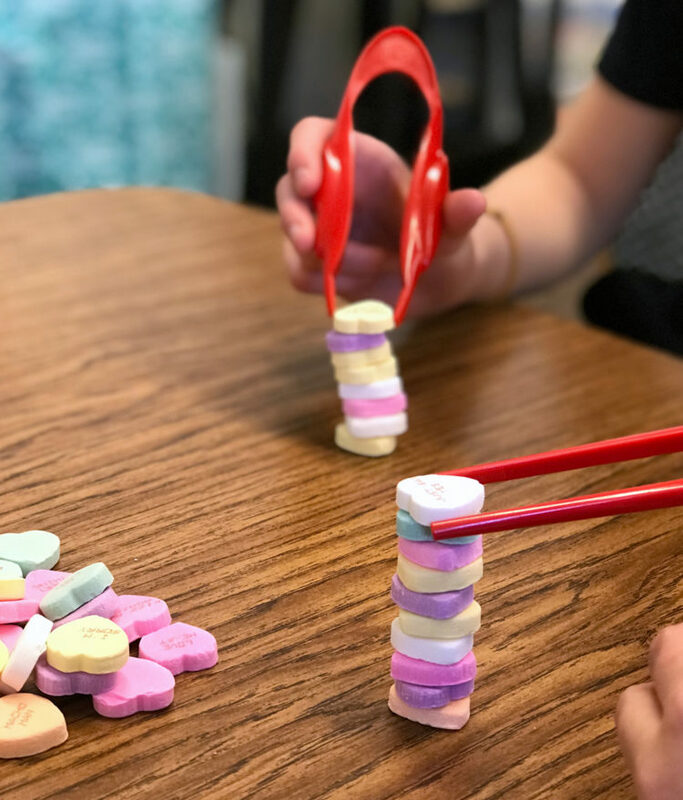 Students have one minute to stack as many conversation hearts as they can. They may NOT use their fingers. When the timer is up they compare their tower to their friends. You could use individual packs of little conversation hearts if you prefer. They’re a bit more challenging, but then students would have them to eat later. 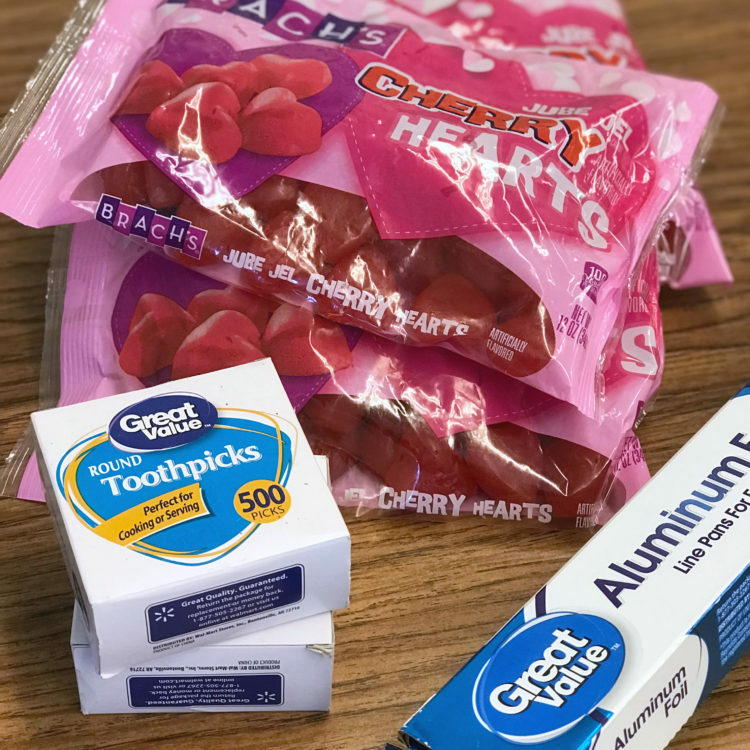 I simply tell my students that these candies are NOT for eating under any circumstance, but they will be rewarded for not eating them after. Then when they leave this station, I give them their own heart (or two) to eat. 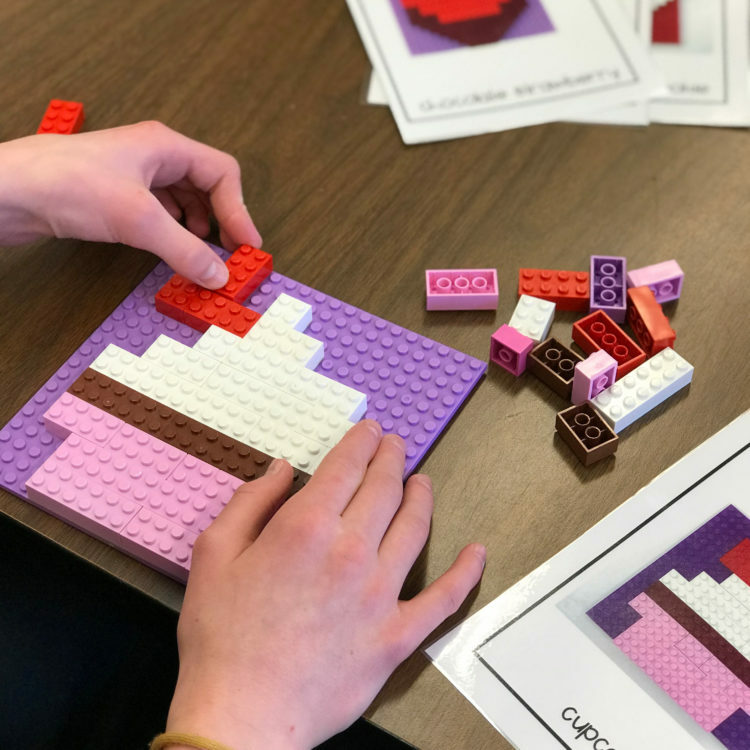 Like Lego Stations, this activity is engaging and very very very INDEPENDENT which is essential for party day activities. You can choose the difficulty (there are two levels) and the type of extension activity you want them to complete. 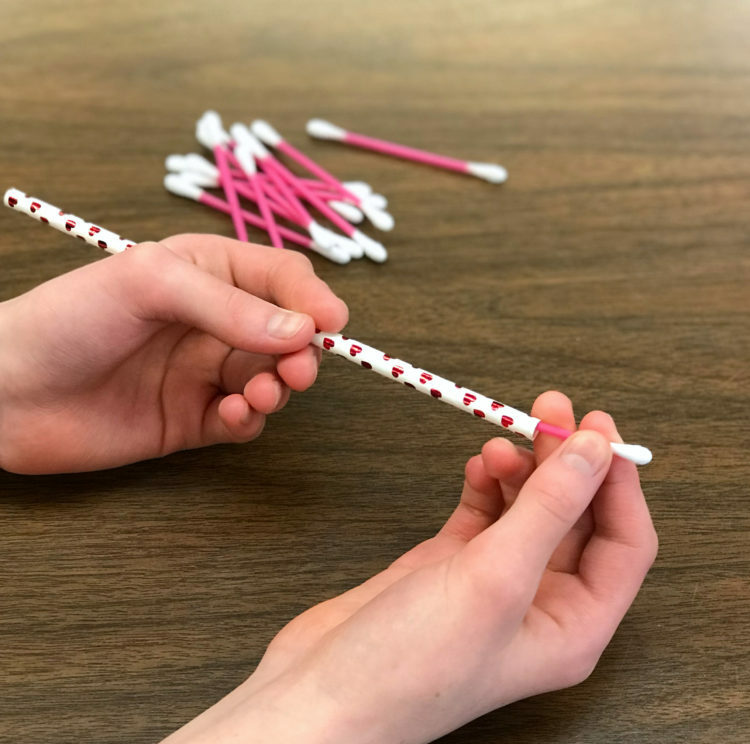 I like to have my students count the rubber bands they use, but there is also the option to have them trace the vocabulary word associated with the picture. 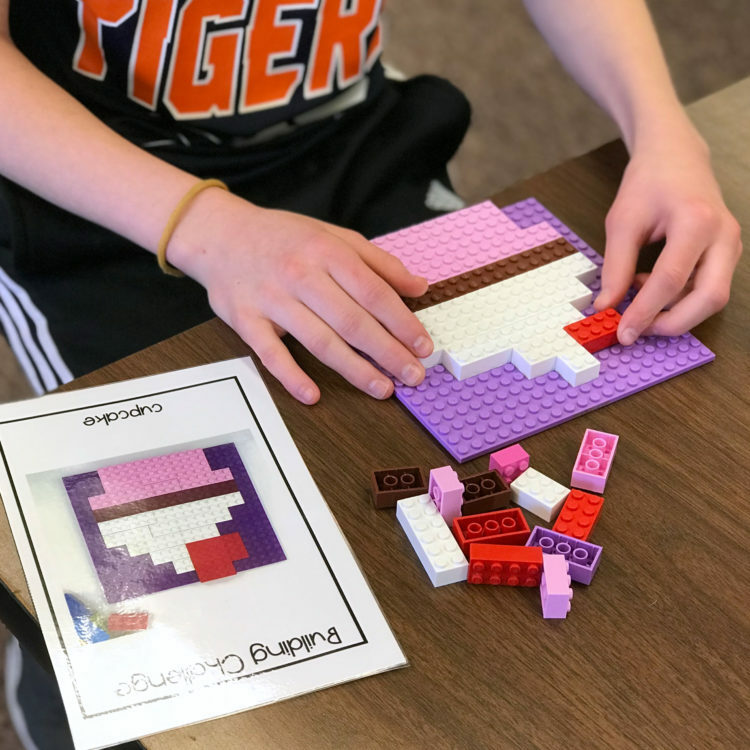 There are about 12 images of each level of difficulty, so they can complete one and move onto another when they are done. 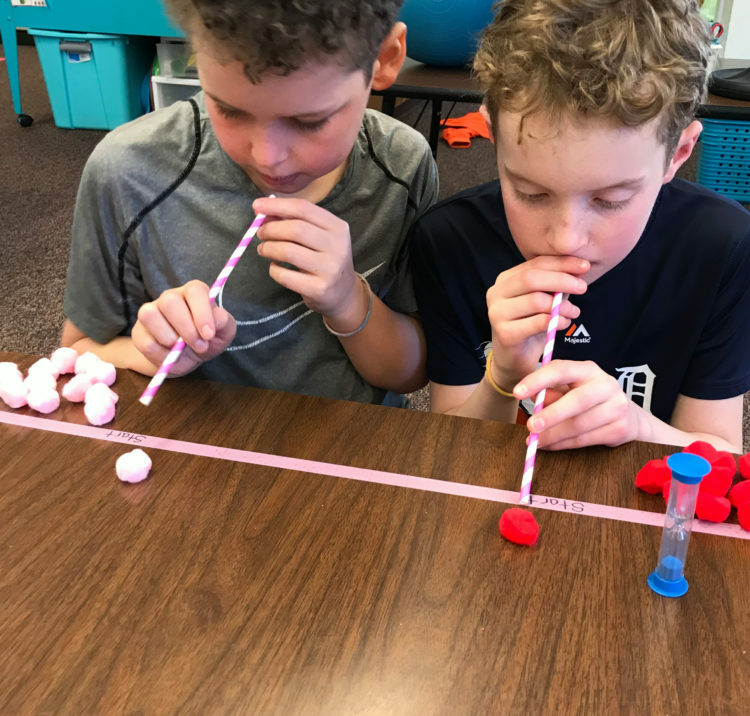 Oh the fun you can have with a straw and q-tips. 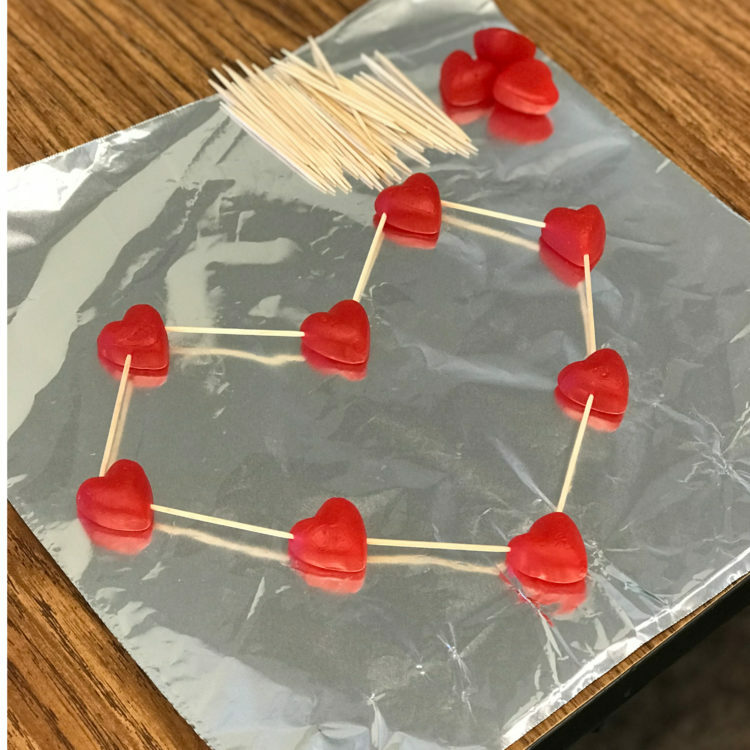 I saw this idea on the Hopeful Homemaker blog and tried it out on my students. It was love at first sight. 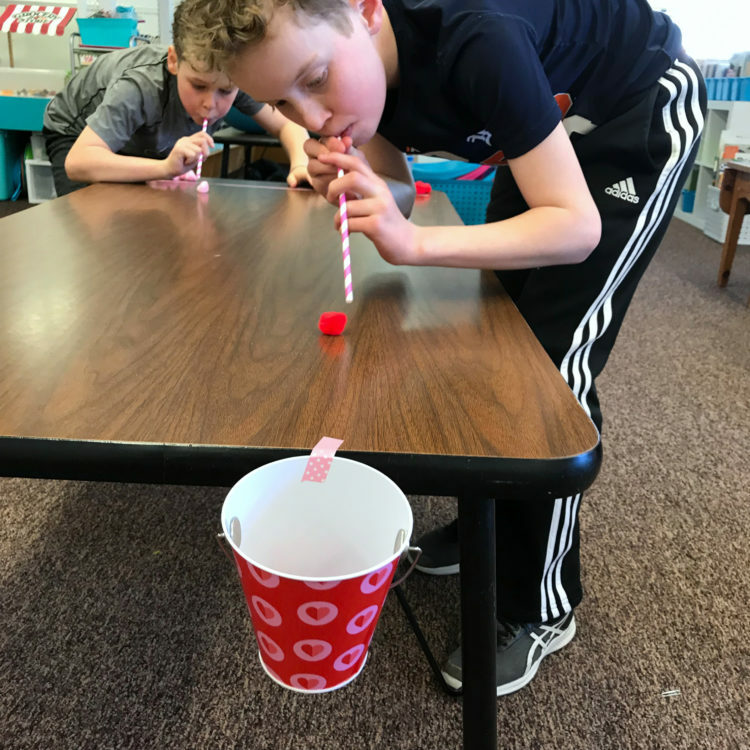 Students ‘load’ their arrows into the straws in an effort to shoot “arrows” into a heart-shaped container. This a perfect idea that I got from Lemon Lime Adventures. 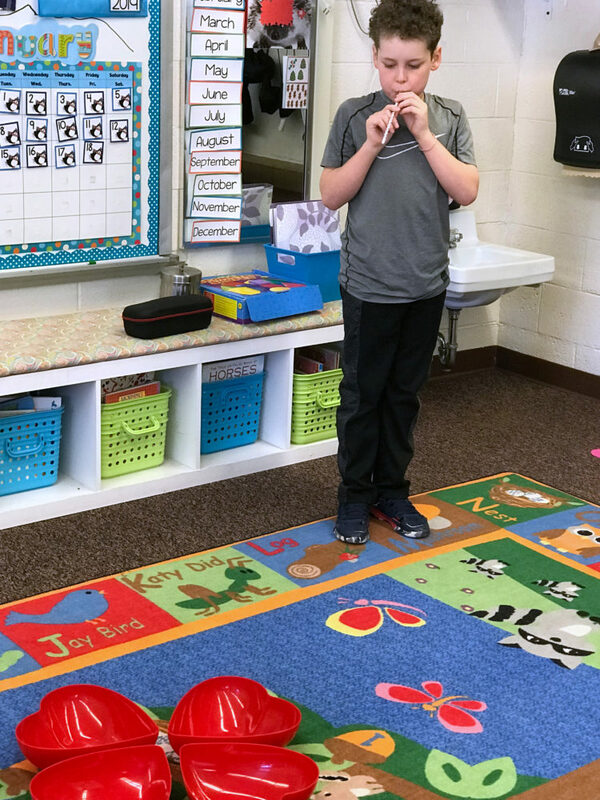 We are always working on shapes in my class. 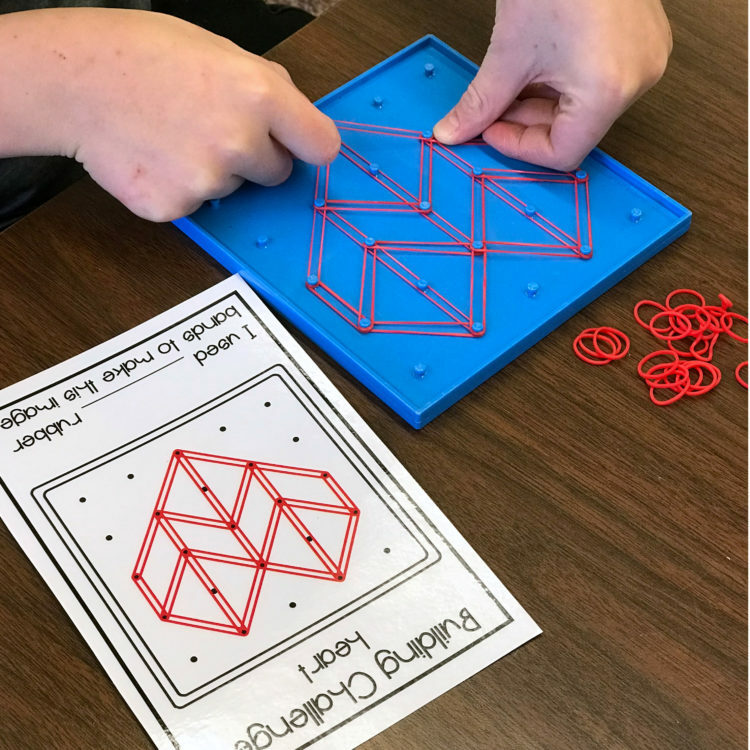 Some of my students have progressed to recognizing and reproducing 3D shapes such as cubes and pyramids, but I still have some little ones working on their 2D shapes. 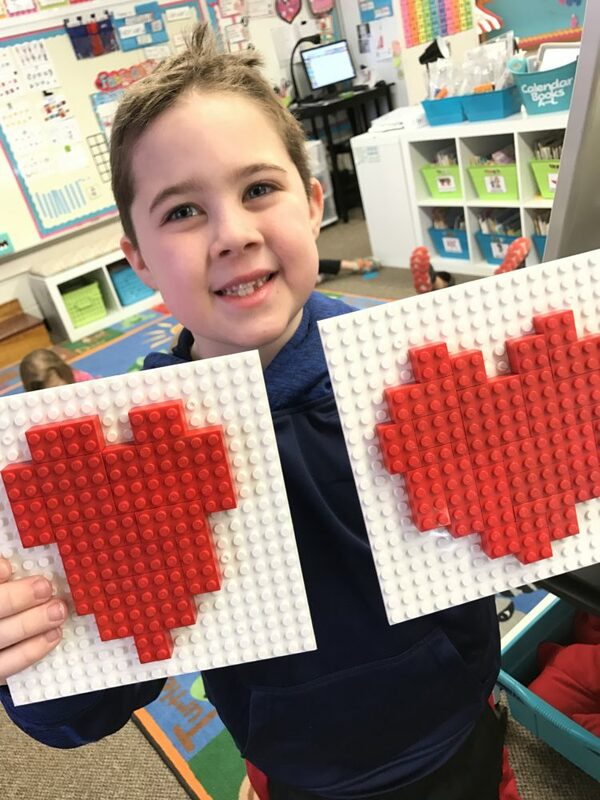 For this station, everyone gets the initial challenged to make a heart using some fun building materials. 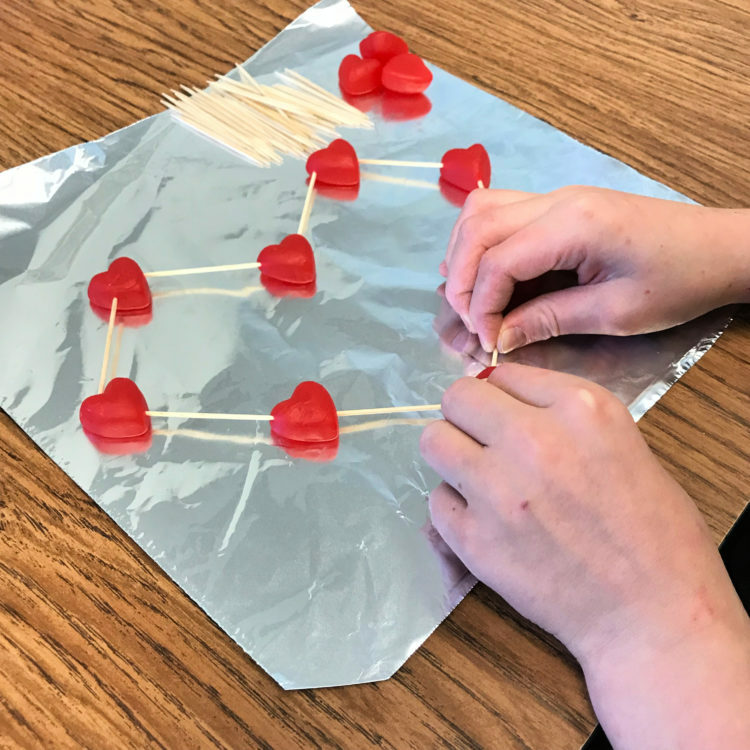 If they successfully complete that task, they can work on making other 2D and 3D shapes. It’s a fun and yummy activity they’re going to LOVE. 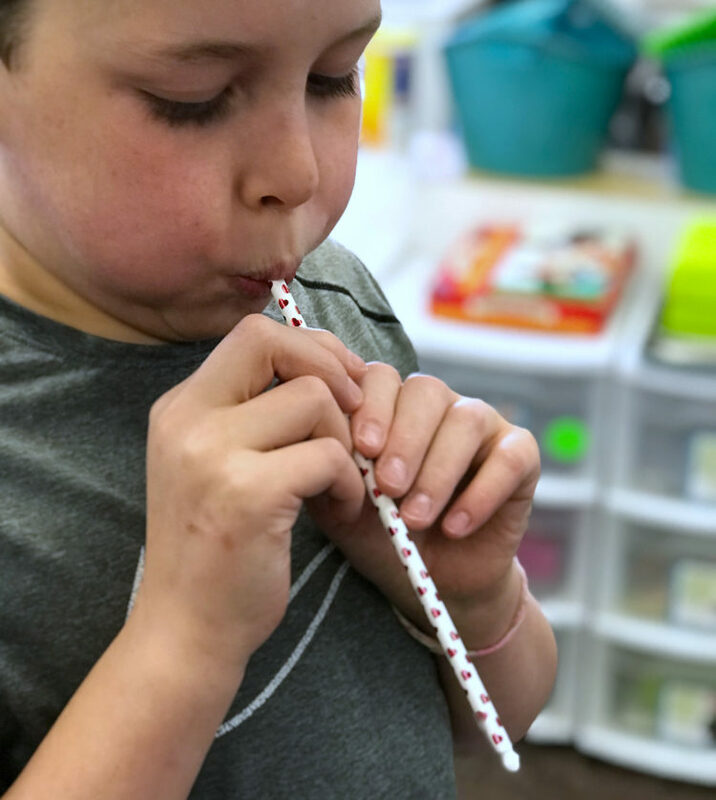 If you’re like me, you’ll want to prepackage this activity so students can eat their creations after. It’s pretty easy. I have little snack bags that I put some toothpicks and hearts into. Students grabbed a piece of precut tin foil and went to work building. When this station is over, they can throw away their toothpicks and tin foil and keep their hearts to take home and snack on later. 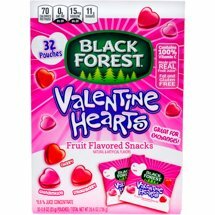 So I used the Brach’s Cherry Hearts, but I did see some Black Forest brand heart-shaped fruit snacks at my local Walmart that you may want to check out. They may work and they are individually wrapped. They may be a good alternative. So there you have it. Take your pick of which stations you would like to use and which you want to pass on, but just know, these will be easy peasy for you and oh so much fun for your friends. The day will be a success and enjoyable for all of you. Deal Me In . . .
Who Loves February Morning Work? I do! And You Should, Too!